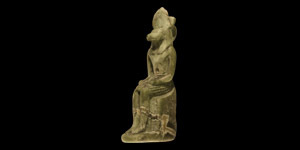 A detailed glazed composition pendant of Anubis, seated on a throne, wearing a lappet wig with sun-disc above, wearing a striated kilt. 2.4 grams, 30mm (1 1/4"). Fine condition. From a UK collection; formerly in an early 20th century collection.